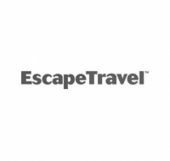 Escape Travel is passionate about delivering amazing holiday experiences tailored to make your dreams a reality. With over 165 stores across Australia, our passionate team of consultants are with you every step of the journey. Offering a superior range of exclusive airfares, tailored holiday collections, accommodation, cruises and tours, as well as an elite range of travel add-ons, Escape Travel can assist with every aspect of your dream holiday.